We have four lovely chooks who, until recently, provided us with all the eggs we needed plus some surplus. But one by one they all went broody. My knowledge of chooks is not great - I rely heavily on the internet for information. I also asked around my friends and family for advice. My understanding of this whole broody thing is that the chooks go through a hormonal thing and decide it's time to have some chicks. In our situation that is really not going to happen especially given that we have no rooster. But our four lovely chooks obviously didn't know that and spent nearly all of their time snuggled down in the nesting boxes - and not producing any eggs. After asking around we finally found a solution that has worked. We blocked off the nesting boxes from the rest of the coop for two days. 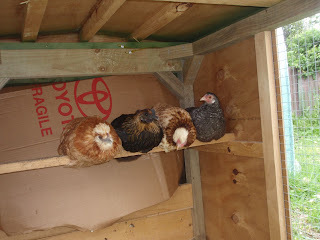 The picture below shows my four girls looking distinctly grumpy sitting on their perch. They seemed to feel this was cruel and unusual punishment but once we unblocked the nesting boxes their whole mood was different - they were back to scratching around in the grass, eating well and happily clucking. And the best result is that today we had an egg! Yay! At least we now know what to do. Quick, someone lock me out of my house, I might stop brooding! I'm curious how the chooks laid an egg without a rooster around? Did I miss something? How are your chookies doing now in 2010 - egg production up I hope.